The Freeride Beacon is the smallest, lightest, and cheapest way to get past gear check at a race. With only one antenna, it’s not the best avy beacon for recovering buried buddies, but it meets the requirements of ISMF races. It’s easy to turn on and show that it’s real to the most-likely-awesome volunteer. But hopefully there will be plenty of antennae and plastic shovels to go around if there is an avalanche at a race. Fully digital transceiver operates in the standard 457kHz band, conforming to ETS 300718. Weighs just 112 grams (4.0 ounces) with the battery and fits easily in a skin suit pocket. Search range of 40m if oriented in the optimum direction, which is a crapshoot. 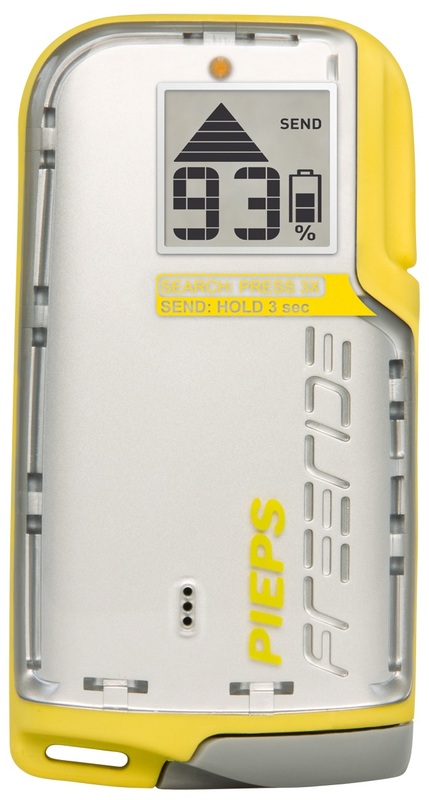 Supports the Pieps iProbe standard so it can be deactivated by an equipped searcher. Aimed at side-country and resort riders, it’s probably not safe enough for the former. A piece of trash for my purposes. Kudos to Skimo for an honest description and finding the one thing this beacon is good for. It is a little smaller and lighter than a functional beacon and for racing applications would be just fine. I just can't give this thing a good rating, however as it is considered by far too many people to be safety equipment. It is to a real beacon what a loop of string is to a seatbelt or a toque is to a helmet. Frankly, I would rather it was built without a search function and simply transmitted, something it is perfectly adequate at doing. Buy if: you will never, ever need to search for anyone with this beacon. Do not buy if: you will ever, ever need to search for anyone with this beacon. This was my first beacon, because I got it at a too-cheap-to-pass-up price. I bought it well aware of the limitations of single-antenna tech, but ended up practicing with it a fair amount anyways. I was able to find 2-3 victims inside of 5 minutes, repeatedly, on the test course. Is this representative of real-world conditions? I'm not sure. That said, the average buyer on Skimo.co has a different purpose: meeting skimo racing regulations, in an environment where avalanche burial is a negligible or minimal hazard. For this purpose, the PIEPS Freeride fits the bill, and is the smallest and lightest beacon I have ever held. My 4-star review reflects the intended use, along with the fact that PIEPS should at least have been able to put a second antenna on the thing while keeping it cheap and compact. How expensive could that really be? Finally, after selling mine and acquiring a PIEPS DSP Sport, I ended up buying another Freeride this season for equipping friends who want to try some barely-backcountry stuff in non-avy terrain. Smart? I don't know yet, but I plan to be very cautious about it. Overall: Three Stars to reflect some sort of weighted average for, well, first and foremost, Five Stars to . . . Skimo Co for the only honest etailer listing I’ve ever seen for this beacon! And Five Stars to the product if you intend only to slip it inside a zippered lycra suit pocket for races. But if you ever try to find someone else with it, One Star. Background on product familiarity: I owned one for a while, ran it through many tests, thought about using it for just some late-season tours in a pants pocket, then thought better of it. I sure hope the person who bought it from me is using it only for rando racing or lift-served skiing, or some other reasonably anticipated victim-only application, yet not searching. First, the first impressions out of the box: When stripped of its harness (which is surprisingly bulky, or at least was bulky back when it was essentially just borrowed from the mesh Pieps DSP harness), the Freeride will save you about three ounces over the next-lightest beacon on the market. It will also fit much more easily inside a suit pocket too than any other beacon. The Freeride is so light and small though because it has only a single antenna. So the pyramid-style digital display is showing only signal strength, not direction. And unlike the somewhat similar bar graph on the old Ortovox M1/M2, the Freeride lacks any sensitivity adjustment. And unlike almost all other single-antenna beacons back in the day, the Freeride lacks analog acoustics, which can be very helpful for resolving a multiple-burial search. But at least it does have an indicator for the presence of more than one signal. Second impressions, in use: Okay, so maybe if you practiced enough you could get okay at searching with no directional indicators (from the lack of a second antenna), and eventually work your way through the inevitable nulls and spikes during the final search phase (from the lack of a third antenna). Maybe. But you had better start off with a victim conveniently buried close by you. With bad orientation from a test target, initial signal acquisition can be under 15m, which means the Freeride won’t work with the standard recommendation of a 30m search strip width. Even worse, Pieps specifies a 40m search strip width for the Freeride, meaning that a Freeride searcher has a pretty “good” chance of walking right by a buried victim. Third impressions, for long-term durability: The beacon spec calls for surviving only a 1m drop onto a hard wooden surface. So as with any beacon, be careful.